Installing the upgraded leisure batteries over the weekend. I say leisure batteries, as being in the motorhome in Europe, they are a lot more relaxed in free camping, or stopping in lay-bys, than we are in the UK. To that end, and not wanting to spend all my time in a big campsite hooked up to electric, I am going solar for the main time and rigging in 2 x 120 ha batteries to give me 240 ha of off-grid time. I am putting 2 x 100 Watt solar cells on the roof which should recharge me 60ha a day (they will come in a later post), so as long as I have an eye on what I am using I will be fine! Backing this up with a 1000W inverter for laptop etc, and LED lighting where I can. The spare wheel sitting exactly where I need to be. 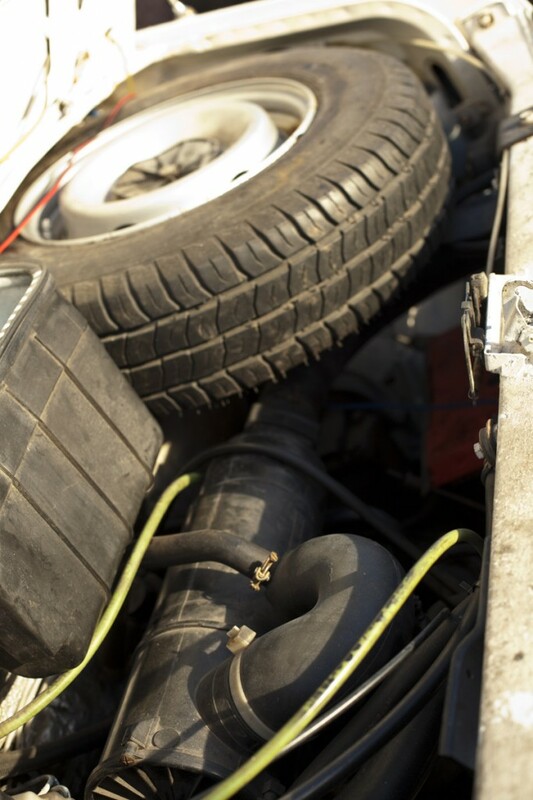 Installing 2 leisure batteries are all very well and good as long as you have the space for them. And for Caravaggio, who was born 20 years ago, I don’t think they envisaged having so much stuff in there. Needless to say, we only have enough space for a single standard sized battery in the bonnet, so this has got to be adapted. The new 120 ha batteries are slightly bigger than standard, so it will have to sit on the tray and then get strapped in. Connecting two leisure batteries in Parrallel will combine the amp hours of the two, so what I needed to do was find space for the second battery. Under the wheel the old standard battery which needs to come out. Also another hole for the big linking cables needs to be put in the chassis, top left. 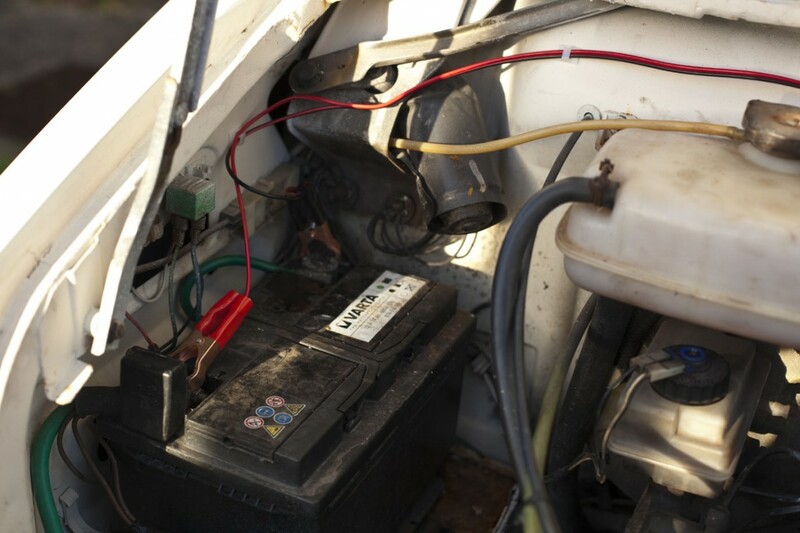 Apart from the physical size of the battery, to sit it inside the camper meant another issue had to be contended with in relation to the size, make and behaviour and that was that it needs to be a sealed version so that it doesn’t give off any gas when charging. The ideal space was found underneath the passengers seat and the battery size (which also dictated the charge capacity) had to be able to fit in here comfortably. Again, it will be strapped in securely. 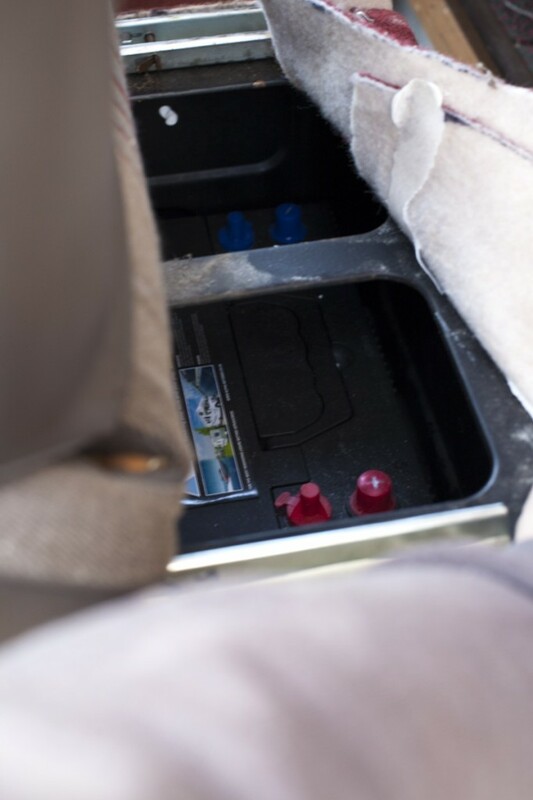 The internal leisure battery sits under the passenger seat with about 2mm to spare at the sides. Phew! Now, doing my homework and reading up on the actual electrical connections between the two batteries, revealed that electricity will lose charge over a length of cable and so the connecting cables had to be of sufficient diameter to not lose any. Connecting cables from Halfords were about 18 inches long maximum, though I did buy two little 6 inch ones for the connectors, but they never got used! I bought some 16mm core cable and this seemed similar to the cables in Halfords so I was ok, and assured by the staff there when I asked, that the ampage was 12 volt! Thanks Google! 3 metres was enough to get me from the front of the van to under the seat with a bit of tucking and twisting and a hand to go under the trim. 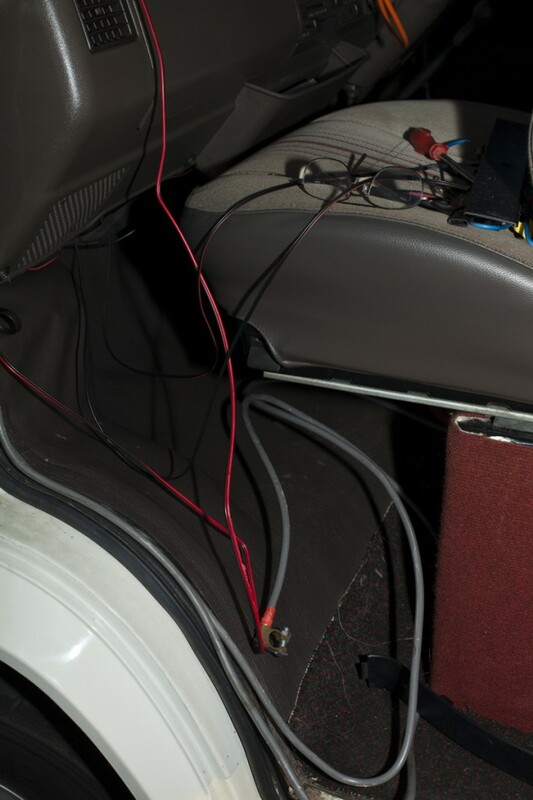 The thick 16mm cable coming through to connect the batteries together being fitted under the trim. Rather than investigating the whole electrical connections that existed on the old battery, we just replaced the old connectors on to the new battery. 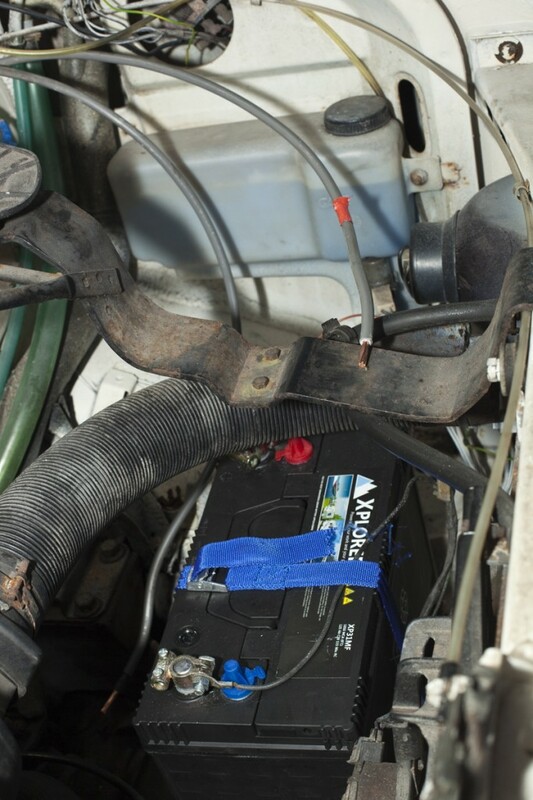 Though we did remove the cabling for the inverter which can be placed with the solar cabling on to the internal battery. 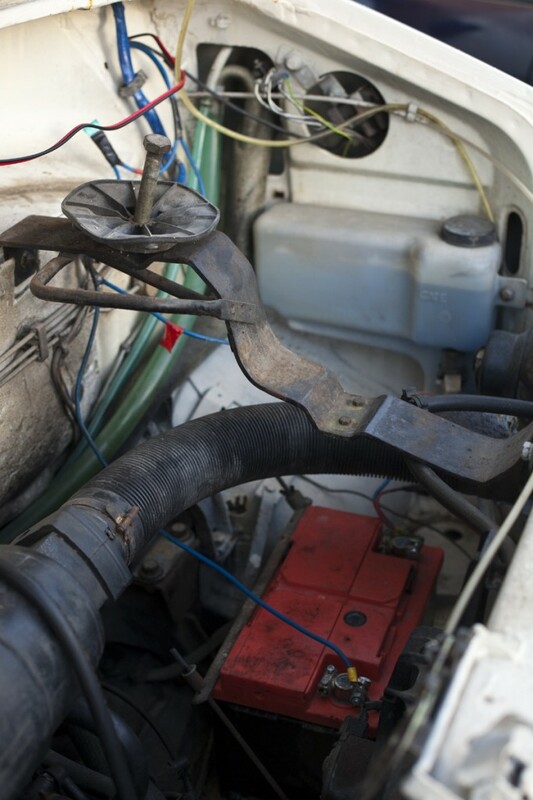 As for the existing electrics, Caravaggio has internal wiring that will charge the batteries when either hooked up to electric or whilst driving. The solar will kick when wild camping. The new battery and cabling ready to be joined up. The small detachable solar panel sits in the front of the cabin when stationary to charge the starter battery. This is not as strong as the leisure charges as it just needs to trickle charge the starter battery to stop it from losing it’s charge if not being driven about. It is a bit of paranoia that made me do this, but I don’t want a flat starter battery if I have spent three weeks at the side of Lake Gardia! 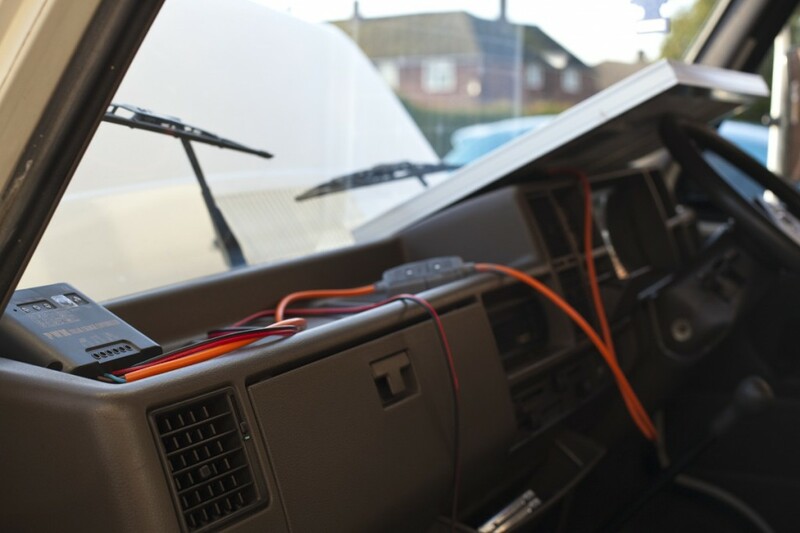 The solar charge controller, front left, will be permanently secured with the connector plug accessible for the solar panel to be connected when parked up (orange cable). Now the new leisure batteries have been fitted I was able to hard wire in the business end of the solar charger cable to the starter battery. I had been swapping the charger between starter and leisure battery before hence the bulldog clips, but it can now be hard wired in with some ring connectors on the battery terminals. I even put cable grips to tidy the charge cables up, but they all came unstuck when I had to remove it to change the bulldog clips. Super glue anyone?? ?